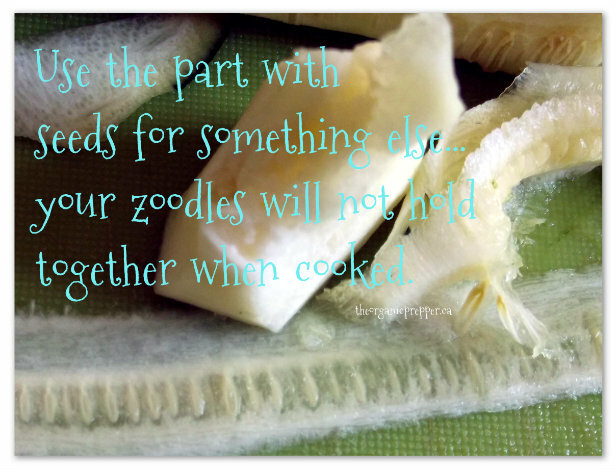 A while back, I read about two wonderful things….Zoodles and Squashetti. I have more zucchini than I know what to do with, so I decided to try it out. 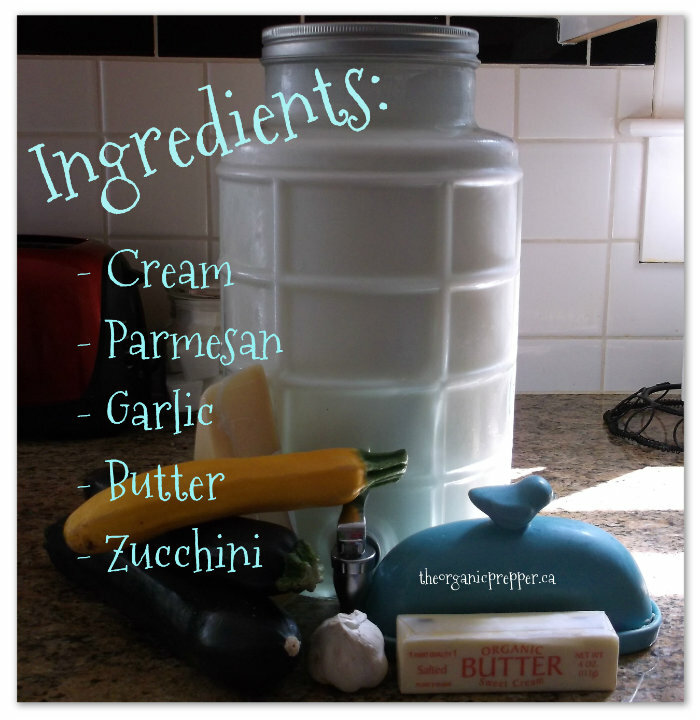 Another great thing about zoodles is that they can be dehydrated…here’s how ! 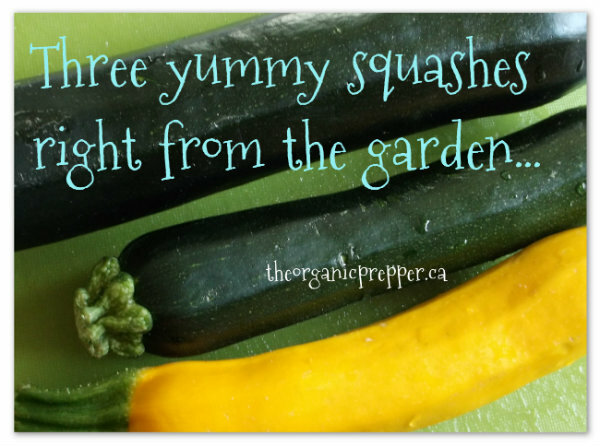 This is a great way to save some of that garden goodness for later on in the year when your garden is no longer spilling forth produce. Although we haven’t started our Grocery Store Rebellion  yet (August 1 is our official starting date) last night’s meal was almost entirely grocery-store free. The only things purchased at the store were the organic chicken and butter that we used. (Once this butter is gone, we’ll be making our own from scratch.) I made a delicious meal from garden goodness in the form of garlic and zucchini, raw milk from my friendly farmer who sold me a milkshare, cheese made locally that was purchased from our co-op store, and some spices from my spice drawer. First, make your zoodles. You’ll want to have these prepped and ready to go into the pot of boiling water before you make your sauce. Timing is everything! Scrub your veggies well and cut off the stem and blossom ends. 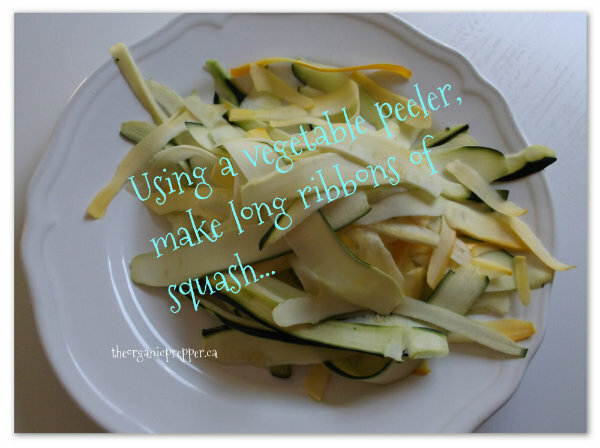 Because I don’t have my spiralizer yet, I used a vegetable peeler for this process. I left some of the peel on because I like the way it adds some color and density to the dish. 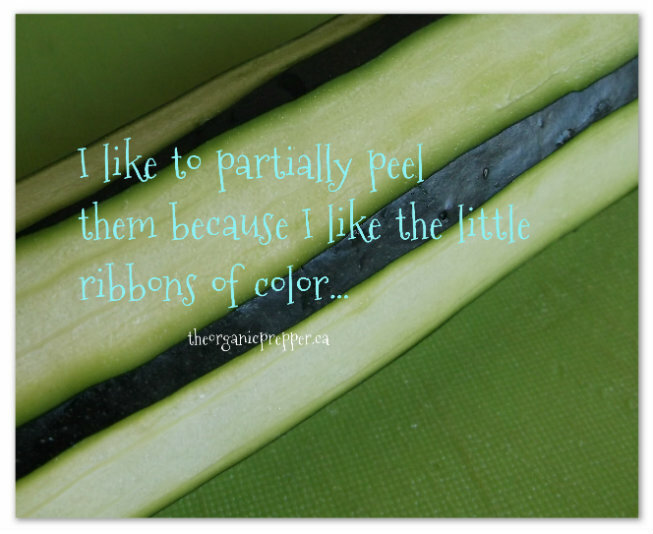 Using your vegetable peeler, make long ribbons of lovely squash and zucchini. When you get to the seed-y part, stop making ribbons. It will fall apart when you cook it. Save that for your compost or your chickens, or find some other use for it. When it’s time to cook your zoodles, drop them in boiling water for about 2 minutes for al dente. Drain in a colader for at least 5 minutes before serving. Toss them in the colander a few times to help get the water out. If you want, you can lightly salt them. Alfredo sauce is the simplest “fancy” thing you’ll ever make. I like to use cream and a substantial amount of butter in mine. If you want less fat, you can use whole milk and cut the butter in half. (Simply don’t add the final two tbsp of butter in the following instructions.) I used gluten-free flour for thickening, but you can use regular flour too. It’s a very forgiving recipe! I used raw milk so I skimmed the cream off the top with a big turkey basting syringe. 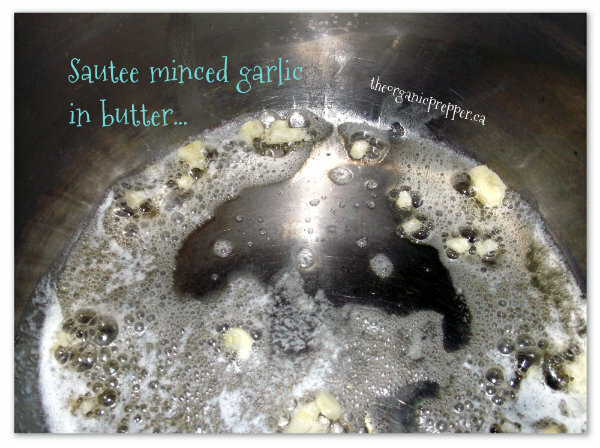 In a saucepan, heat 2 tbsp of butter and saute your finely minced garlic in it until it is fragrant. 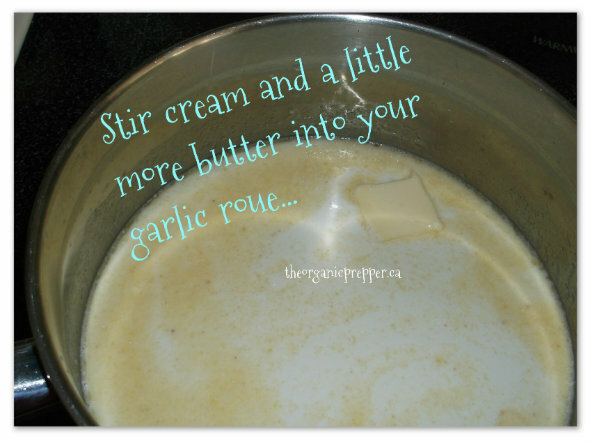 Then sprinkle 2 tbps of flour or alternative into the butter, whisking to make a roue. 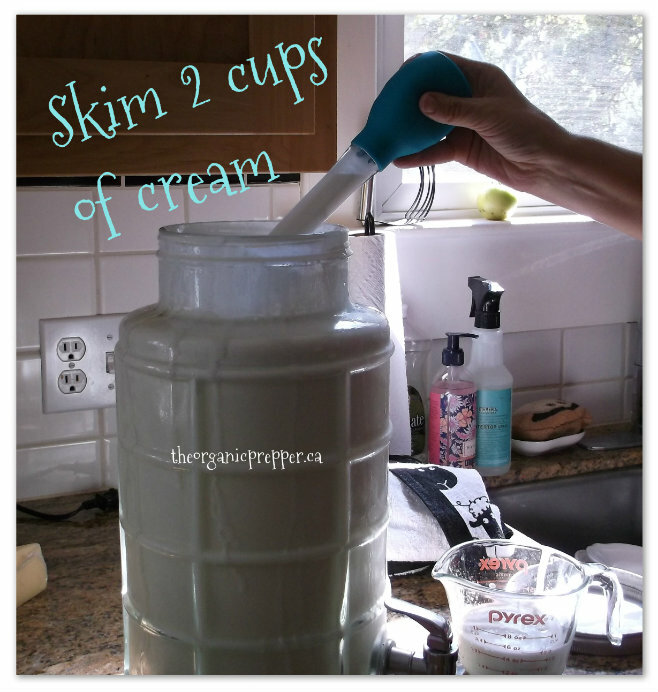 Slowly pour in your milk or cream, whisking constantly. Warm to a very low simmer. 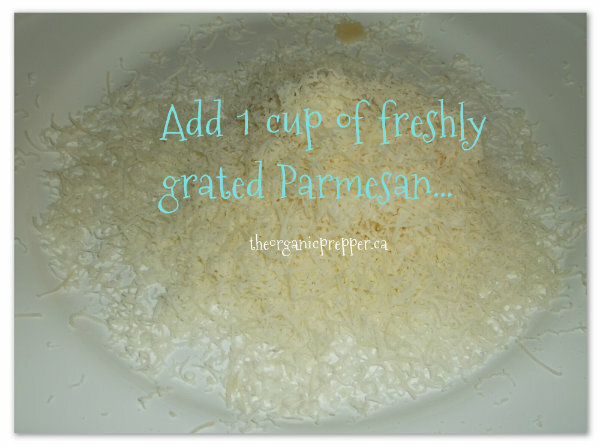 When your cream sauce has thickened to the desired consistency, stir in 1 cup of freshly grated Parmesan cheese. (Be sure to have this grated and ready to go – I had my minion…ahem…kid…do the grating for me while I was working on the sauce.) 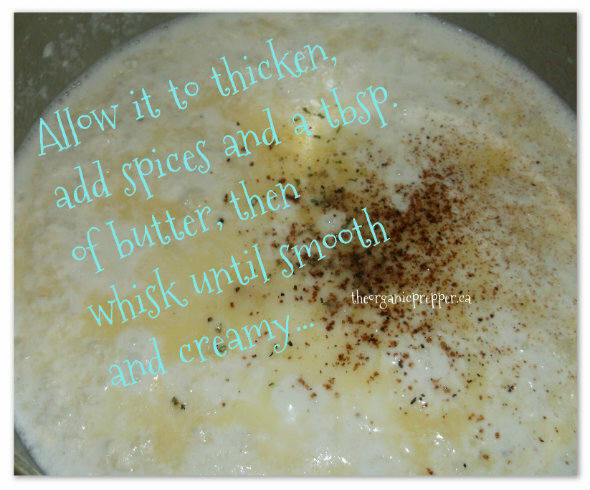 Continue to whisk until it has melted and incorporated into the sauce. Finally, finish the sauce by adding your spices and on final tbsp of butter. Remove it from the heat immediately. Serve the Alfredo sauce over drained zoodles and some grilled or roasted chicken.